LG has lifted the lid on a new, high-end sound bar lineup that will be unveiled for the first time at CES 2019. 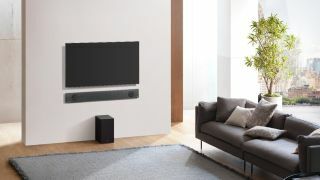 LG’s 2019 sound bar range features three models, the SL10YG, SL9YG and SL8YG. All three new audio devices have been created in collaboration with High-Resolution Audio specialists, Meridian Audio. Meridian’s Upmix technology can up-mix two-channel audio to multiple channels without distortion, increasing sound immersion and upgrading audio clarity. They also support both Dolby Atmos and DTS:X technologies, which will bring clear surround sound to your living room. As well as packing the latest audio tech, the new lineup of sound bars also boasts AI smart connectivity and voice recognition with Google Assistant built-in. All three sound bars have a sleek and stylish design. The LG SL9 is slim at 57mm (2.25 in) deep and has an integrated gyroscope sensor to help you correctly position the sound bar on a wall or flat surface. The SL9 has also already picked up a Best of Innovation honor at the 2019 CES Innovation Awards. The TechRadar team will be heading to CES 2019 and will be getting a hands-on with LG’s new audio products.